I’m a Tour Guide on the island of Ireland. In 2003 I looked after a group of German wheelchair users, which was a real eye opener. Nothing was the way I was used to. Whether it was toilet stops, stops for lunches, photos or visiting sites of interests. Alone embarking and disembarking the wheelchair friendly coach was an adventure. The group arrived in Ireland from Germany, bringing their own coach. 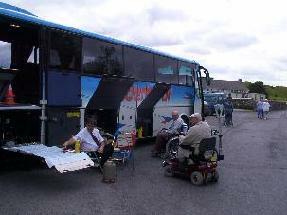 The coach was fitted with a ramp which was able to elevate one wheelchair at a time in and out of the coach. The ramp of course, happened to be on the right hand side of the coach. This fact caused major traffic jams, especially in Dublin, when we pulled up on the wrong side of the road to get the wheelchairs on and off the coach, which was quite time consuming. I often stood back and waited for the clients to be giving out, because they were not being catered for properly. In many cases there weren’t any wheelchair accessible accesses. Kilkenny Castle for example, only the ground floor was accessible. The Old Library (the Long Room) of Trinity College was only accessible by using the goods lift. One wheelchair at a time. However, the clients never gave out. Instead they were praising the Irish and their helpfulness. As far as the wheelchair confined clients were concerned, who happened to be well travelled (including the American and European continents) they rated Ireland above average. Not because the facilities were above average, but because the Irish public was ever so patient and helpful. I will have another wheelchair confined group this coming September and I can’t wait to see in how far things have changed. The project was planned in association with the IWA (Irish Wheelchair Association). 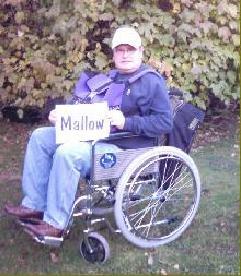 On Monday November 3rd, 2003 I took off in a wheelchair to travel the Republic of Ireland. The aim behind this trip was to raise awareness. The following ten days should turn out to be an extraordinary experience. I experienced the unexpected. I hitched lifts (sitting in the wheelchair) for most of the journey. I had no reason to complain about a lack of helpful drivers. I met a lot of people on the road; delivery-drivers, sales reps, madmen etc, and the wife of a principal who took me straight to a National School, where I spent 1.5 hours talking to the kids. But most important for me was, to find out what it would be like to be sitting in a wheelchair. I found that I had to reschedule my whole day, nothing turned out to be as I knew it. Whether it was finding adequate accommodation, a pub to socialize in or a restaurant for some grub. I met with people who were confined to wheelchairs and those people introduced me to their world – a world which people who are not confined to wheelchairs will have difficulties to understand. Considering it was the year 2003, Supervalu in Midleton were very advanced. They actually offered trolleys, which could be connected to the wheelchair. I couldn’t find another shop in the surrounding area at this time, who offered the same experience. It’s a common problem. That in one way we try to cater for wheelchair users, on the other hand we either don’t really think it through or we don’t want to go the last mile. To not make wheelchair users feel disabled, it is important that they can master as much as possible of their daily routine without having to ask for help. 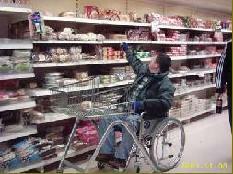 Here, I have a trolley which can be fitted to the wheelchair, but I still need assistance to reach the top shelf. It’s not a matter of taking an item to place it in the wheelchair. It’s a matter of going shopping at ease, to be able to browse products. Look at them and put them back, only to pick up the next product to, let’s say, study the label. This may only be a little bit of thoughtlessness. Now, put yourself into the “shoes” of a wheelchair user. What is he/she going to do? The footpath curb is most probably too high for the wheelchair user to get off the footpath and back on again. Also, even if the footpath was not too high for the wheelchair user to get off and on the footpath to get pass this obstacle, it would be rather dangerous. Let’s be more vigilant. 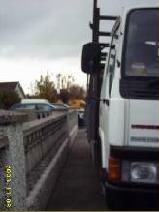 We need to keep the footpaths free of those life endangering obstacles. The picture on the left was taken outside a hotel. I couldn’t get pass the plant pot. Neither was I able to shift it. Whoever decided to place this pot there, stopped me from accessing the wheelchair ramp and disabled my movement. I had to wheel back into the hotel and ask for help. The previous evening, I tried to access the hotel’s nightclub. The bouncer told me that I can’t get in. No wheelchairs allowed, were his words. I asked for the manager. The manager explained to me that the club was wheelchair accessible, but that other punters wouldn’t feel comfortable to see a wheelchair on the dance floor. He also reckoned that I would not feel comfortable and denied me access. The picture on the right is quite typical. It shows a telegraph mast. I can just about make it pass the post, but it’s a matter of millimetres. I was afraid I might slip off the path. It happened quite often that I got off a footpath, only not to find a way back on to it. The lowering of curbs are not coordinated. Getting off on one side of the road, doesn’t mean you get on again on the other side of the road. 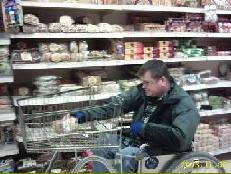 In Tralee, Co. Kerry, I met up with Terry O’Brien who is wheelchair confined. Terry was the mayor of Tralee at the time and did a lot to make Tralee more wheelchair friendly. Terry was the first mayor to introduce coloured parking spaces special needs parking. The colours allowed traffic wardens to see if a car was parked on a parking space, which should be occupied by a vehicle with a special permit. I suggested to Terry that we meet in a particular hotel in Tralee town, but Terry refused, because the hotel was not accessible without assistance. Which he thought was unnecessary. 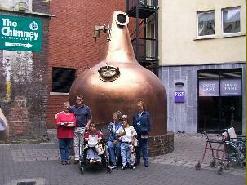 In Kilkenny I met with a lot of people from the IWA and stayed in the IWA centre. They provided me with a room in the centre. 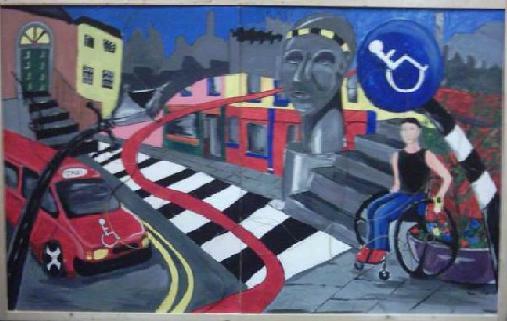 I’m considering to repeat this project, to get a picture of what it is like in 2015, to live in a wheelchair in Ireland. Has anything changed? In the meantime, I would love to hear from you. If you live in a wheelchair and you’d like to share your experience, then I would like to hear from you. You can either contact me through the contact form or you can leave a comment beneath this post. In September 2015 I will be guiding a wheelchair group, travelling through Ireland. This alone will be an eye opener for me.